OBS introduces an actuator for remote control of hydraulic regulators. Read more here. Students at HSN (University College of Southeast Norway) submitted and defended their bachelor thesis week 22. The main objective of the thesis was to compare a traditional hydraulic power system for the operation of a BOP with a corresponding system based on Void Power. 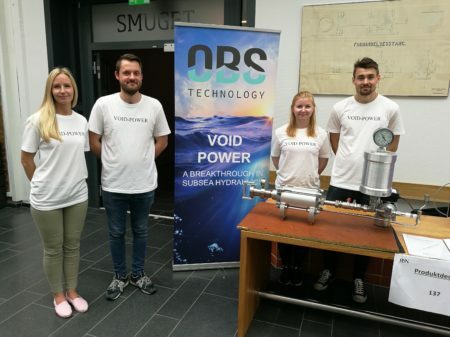 Additionally, verification trials were conducted on a prototype Void system located at OBS’ test facilities at Nøtterøy. One of the conclusions of the report is that the energy density of Void Power is higher than traditional accumulator based hydraulic power systems even at relatively shallow depths. Renate Brynilsen, Thomas Holen, Thea Strand Watterud and Morten Formoe. The submitted thesis received a grade A. Congratulations! IKM Technology in partnership with Statoil has received a grant from the Norwegian Research Counsel for development and testing of a revolutionary variable buoyancy system. OBS will develop and deliver key pump technology based on our VOID-pump concept.